Introduction and objective: Despite worldwide increasing diffusion of robot-assisted radical prostatectomy (RARP) for surgical treatment of prostate cancer (PCa), long-term oncologic data regarding the efficacy of this approach are still scarce. We aimed to report oncologic outcomes of RARP at more than 10 years follow up, from a high-volume centre. Material and methods: We retrospectively evaluated 181 consecutive PCa patients submitted to RARP between 2002 and 2005 at a single tertiary European center. We included in our analyses only 138 (76.2%) patients with follow up ≥120 months. We excluded 3 individuals because of incomplete preoperative and pathologic data, thus resulting in a final population of 135 patients. Biochemical recurrence (BCR) and clinical recurrence (CR) were defined as two consecutive PSA values ≥0.2 ng/ml after surgery and imaging detected disease progression, respectively. First, Kaplan-Meier analyses assessed BCR free survival (BCR-FS), CR-free survival (CR-FS), cancer specific mortality free survival (CSM-FS) and other causes mortality free survival (OCM-FS) in overall population. Second, Kaplan-Meier analyses assessed CR-FS after stratification according to pathologic stage and Gleason grade group. Finally, uni-variable Cox regression analyses were performed to assess the predictors of CR, CSM and OCM. Results: Table 1a and 1b depict characteristics of the population. Overall, 33 (24.4%), 81 (60%) and 21 (15.6) patients were classified as low, intermediate and high risk, respectively. Out of 135 individuals, 34 (25.2%) underwent pelvic lymph node dissection and 76 (56.3%), 44 (32.6) and 15 (11.1) men revealed pT2, pT3a and pT3b-T4/anyT pN1 disease at final pathology, respectively. The overall positive surgical margins rate was 17.8%. Median follow up was 135 months. The 10 and 13.5 years BCR-FS, CR-FS, CSM-FS and OCM-FS rates were 74% and 70%, 89% and 79%, 98% and 95%, 88% and 63%, respectively. Patients staged as pT3b-T4/anyT pN1 and men with Gleason grade group 4-5 experienced significantly lower CR-FS rates as compared to those with less aggressive pathologic features (all p≤0.004). At uni-variable analysis, pathologic stage and Gleason group, adjuvant therapy states and time to BCR were found to be predictors of CR (table 2). 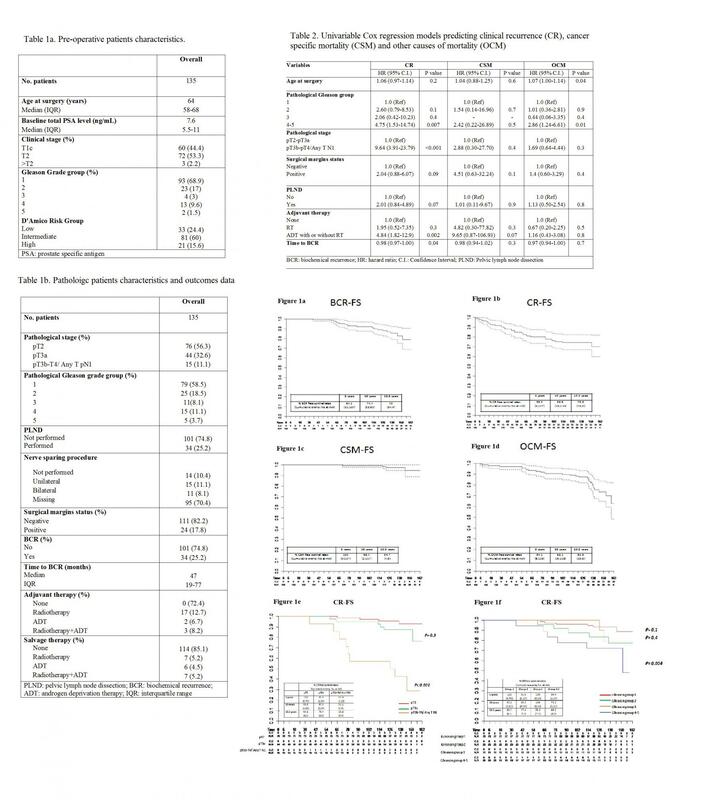 Conclusions: Our results support the evidence that RARP allows to obtain optimal oncologic outcomes at very long term follow up, comparable to those reported by open radical prostatectomy series.